1,800 years ago the Roman army built one of its smallest but most heavily defended forts at the site of Vindolanda, which is now a part of the Frontiers of The Roman Empire World Heritage Site. The small garrison of a few hundred soldiers and their families took shelter behind a series of large ditches and ramparts, while outside the walls a war was raging between the northern British Tribes and Roman forces. Once the war was over (c AD 212) the troops and their dependants pulled out of the fort, and anything that they could not carry with them on the march was tossed into the defensive ditches. The rubbish in the ditches was then quickly sealed when a new Roman town and fort was built at the site, preserving the rubbish in an oxygen free environment where the normal ravages of time, rust and decay, crawled to a halt. In 2016, the Vindolanda archaeologists excavated the ditch and discovered an incredible time capsule of life and conflict, and amongst the debris were dog and cat skeletons, pottery, leather and 421 Roman shoes. 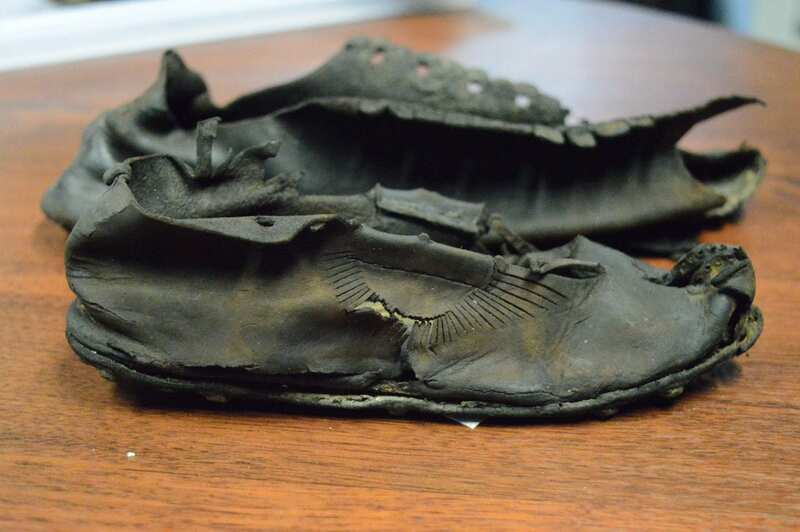 Visitors who were lucky enough to come to Vindolanda this summer watched in amazement as shoe after shoe was found in the ditch, each one a window into the life of type of person who might have once worn it. Baby boots, small children’s shoes, teenagers, ladies and men’s boots, bath clogs, both indoor and outdoor shoes. 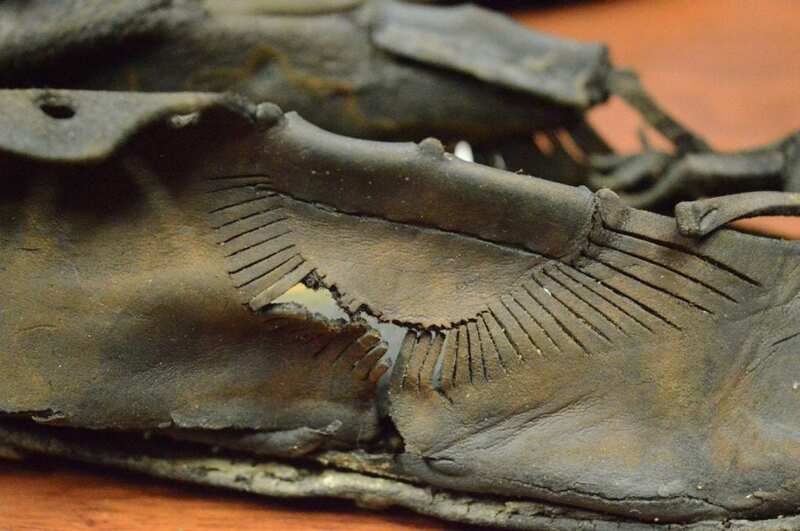 What has been uncovered conceivably represents more than one shoe for every person who lived inside the fort at Vindolanda at that time. Dr Andrew Birley, the Vindolanda Trust’s CEO and Director of excavations was thrilled with what he calls ‘an unbelievable and unparalleled demographic census of a community in conflict from two millennia away from today. The volume of footwear is fantastic as is its sheer diversity even for a site like Vindolanda which has produced more Roman shoes than any other place from the Roman Empire’. The shoe hoard also gives an indication of fashion and affluence of the occupants in AD 212 with some very stylish and well-made shoes, both adults and children’s, a fact which has captured the imagination of football fans with one child’s shoe in particular being likened to a modern Adidas Predator boot. Sonya Galloway, The Vindolanda Trusts Communication Manager noted that ‘the popularity of just one of the shoes has given great exposure to our collection here. It is one of the great assets of Vindolanda’s Designated collection that many of the artefacts are everyday items, things that we can directly connect with, it is the fact that they are so well preserved and almost 2000 years old which is simply extraordinary’. 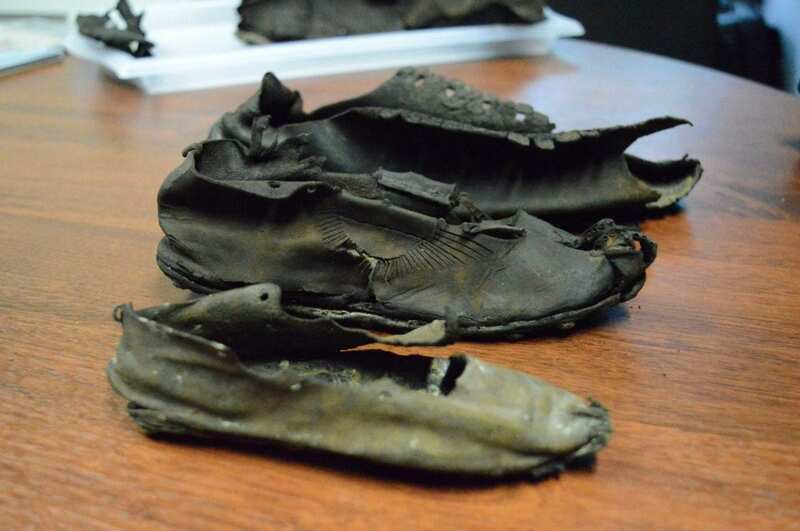 The shoes are now being conserved on site with a specifically re-adapted building to cope with the quantity of finds. The Trust’s Curator Barbara Birley noted ‘the volume of footwear has presented some challenges for our lab but with the help of dedicated volunteers we have created a specific space for the shoe conservation and the process is now well underway’ Barbara went on to say ‘The Vindolanda Trust is committed to the excavation, preservation and public display of its finds although each shoe costs between £80 and £100 to conserve.